Students should prepare a solo and two octave Major scale in D.
Shelley MacAllister teaches orchestra in San Jose at Hoover Middle School. Previous to this Shelley, taught 4th-12th grade Strings in Spokane Valley, Washington. This is her 5th year in SJUSD, having taught the Strings Program at Trace Elementary from 2009 to 2014. Prior to teaching Shelley played viola professionally for the King's Royal Flemish Opera in Antwerp, Belgium for 12 years. During that time she also performed as a singer and actress, in opera and musical theater. 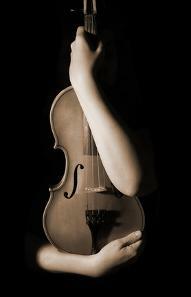 She also played professionally as a violinist and violist in the Spokane Symphony. Shelley obtained her B.A. and teaching credential from San Francisco State and her masters in Music Education from Eastern University in Cheney, Washington. Shelley has a passionate love for teaching strings to young people. She is absolutely at her happiest when working with orchestra students! She is very grateful that SJUSD has a thriving orchestra program.